Mr. Noah uses his boat to rescue an assembly of animals stranded on an island by floodwaters. In this loose interpretation of the Old Testament story of Noah and the Ark, there is no mention of God, though the basic elements of the biblical story are all there. The creatures live in the “animal kingdom,” and Noah apparently just happens to arrive with his boat in time to save the group. Only a few animals are stuck on the island at the beginning, but this cluster inexplicably expands with the turn of a page. 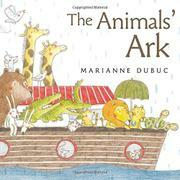 The animals board the boat in traditional two-by-two fashion, and they frolic and play as the rainstorm continues. When land is finally sighted, Mr. Noah drops the animals off at their new home and sails away. Featuring a naïve style and copious white backgrounds, soft-focus colored-pencil illustrations portray comical creatures and appealing animal antics. Sharp-eyed children will notice some logical discrepancies in a story that is based on pairs of animals, as there seems to be only one cat (and several other animals are mentioned only in the singular), and Mr. Noah appears to be missing the companionship of Mrs. Noah. By changing Noah’s role in the story, the reworked plot loses the religious background of the tale without improving on the traditional storyline. In this interpretation, Noah is just a “kindly” boat captain, and the flood is just another major weather event.